There are a number of Animals and Monsters that ally themselves with players in MapleStory. In MapleStory, players have the option of buying Pets, monsters that follow behind you and respond to commands, from the Cash Shop for either Maple Points, from events, or Nexon Cash, bought with real money. There are numerous different types of pets, and in some versions they have varying abilities or stats. Pets, like their owners, have levels, which are raised by "Closeness" instead of "Experience". Closeness is gained by feeding the pets and talking to them. The Kitty is one of the first pets that ever came out. It's very basic and has no special abilities. As she was the first to come out, many players have these since the beginning and they tend to be very high level. These are also some of the cheapest pets. They aren't very obedient. Sometimes seen wearing Bucket Hats of various Colors. The Puppy is also one of the first pets that ever came out. It's very basic and has no special abilities. As he was the first to come out, many players have these since the beginning and they tend to be very high level. Needs to be fed more often than the Kitties. These are also some of the cheapest pets. Loyal and Highly obedient. Sometimes seen wearing Top Hats. The same as a regular Kitty, except this one is black. She came out later than the others, but is still a very basic pet. Like a Brown Kitty, it's not very obedient. Sometimes seen wearing Bucket Hats of various Colors. This is a Miniature Kargo, before he grows up. These are loyal pets that run along behind and follow commands well. They're among the hungrier pets in the game, so keep a good supply of Pet Food handy. A few Mini Kargos even have wings. This pet Rudolph is, or rather was, a seasonal pet that only came out around Christmas time. Now, he has a permanent fixture of the cash shop, which has decreased their rarity. Miniature versions of Santa's Helper. In GlobalMS, he was glitched for a very long time. Sometimes seen wearing Rudolph Hats or Christmas Cones. May be related to Mu Lung's Reindeer. Dasher are almost the same as Rudolph. These are not available in GlobalMS. They are very smart and obedient, picking up on commands fast. They don't have a voracious appetite, so feeding them isn't an issue. Sometimes seen wearing Rudolph Hats or Christmas Cones. May be related to Mu Lung's Reindeer. Husky are smart, loyal, and hungry pets. They do well in cold environments. They don't have a great appetite, though it might come as a surprise. Active pets, and some wear Fur Coats and Yellow Tights, or even Pig, bunny, and Skeleton suits. May be related to Ice Wolves or Hectors. Black pigs aren't the smartest of pets. They live to eat, making them very hungry and needy for attention. Black Pigs like to pretend that they're Orange Mushrooms and will sometimes be seen sporting lacy bonnets. White Rabbits came out in 2006 during the Easter event. They are well behaved and quiet most of the time, but can be quite stubborn. They aren't particularly hungry, so feeding them shouldn't be a problem. Rabbits often wear Red Scarves around their necks. These are also some of the cheapest pets. This is the Pink variant. Like White Rabbits, they came out in 2006 during the Easter event. They are well behaved and quiet most of the time, but can be quite stubborn. They aren't particularly hungry, so feeding them shouldn't be a problem. Rabbits often wear Red Scarves around their necks. These are also some of the cheapest pets. Pandas are unique among pets. They first came out in June 2006, and during a special event had black and white panda name tags. They're fairly rare in the pet world, and a favorite of owners. Pandas are calm and gentle creatures that feed on Bamboo. They don't eat that often, however. Pandas have a tendency to wear bizarre outfits, like clown suits or lit Jack-O-Lanterns on their heads. Interestingly, the flame on the Jack-O-Lantern is surrounded by an air bubble when underwater. May be related to Pandas in Mu Lung. Dino Boys are aggressive pets. They're active and unpredictable, making owning one an interesting experience. They have a hot temper, and can breathe fire when angered. Unfortunately, they can't put this ability to use in battle. These are very hungry pets, so keep a full stock of Pet Food on hand. They think they're royalty, and so wear crowns and royal capes from time to time. Also, near Halloween, they can be seen wearing Ghostly suits. May be related to Drakes. Dino Girls are aggressive pets. They're active and unpredictable, making owning one an interesting experience. They have a hot temper, and can breathe fire when angered. Unfortunately, they can't put this ability to use in battle. These are very hungry pets, so keep a full stock of Pet Food on hand. They think they're royalty, and so wear crowns and royal capes from time to time. Also, near Halloween, they can be seen wearing Ghostly suits. May be related to Drakes. White Tigers are among the rarest of pets. Out of the snowy fields near El Nath they emerged. Tigers aren't hungry pets, and are fairly content most of the time. They're obedient and skilled in a number of ways. White Tigers can sometimes be seen running around in Ninja outfits or Magician's robes. In some versions, White Tigers will automatically heal if your HP falls below a certain point. Monkeys are active and wild pets. They're smart, but not too obedient. Their Favorite delicacy is, of course, the banana. Monkeys have a reputation as thieves, and as such wear the stereotypical loot bag on their back from time to time. This ability can be put to use by their owners, as monkeys, in some versions, will run along looting, even while standing still. May be related to Lupin or Peach Monkeys from Mu Lung. This is a unique pet that originated in GlobalMS in the thanksgiving event 2006. They were awarded very rarely for a Thanksgiving quest. Turkeys aren't hungry pets, but very disobedient, doing as they wish most of the time. They're obviously related to the Turkey Monsters that appear during this time as well. Sometimes, they can be seen wearing Rudolph hats, trying to blend in once November has ended. Penguins are cold loving pets that were released in December. They originated near El Nath, unsurprisingly. They can be quite energetic and emotional, but are generally happy pets. Penguins are one of the hungrier pets in the game. They wear Earmuffs when it gets really cold. Penguins are probably related to Jr. Pepe found in Orbis Tower. The Robot is an unpredictable pet, and changes shape sometimes. They were released only very recently, so not much is known yet. They tend to be very easy to please. Robots are very active, but not very hungry. Their favorite snack is a fresh set of batteries, though for some reason in GlobalMS they are called "Micro Chips". Robots are probably related to the Tobo and Master Robo found in Ludibrium Toy Factory. One of the most expensive pets. This is a Miniature Yeti, a child roaming the cliffs near El Nath. Sometimes, it dons a baby Pepe on its back, imitating its parents. These are very popular pets, but among the most expensive. In some versions, yeti have auto looting and auto potion abilities. Fairly hungry, very smart, and usually quiet. A good pet to have at your side. Don't be fooled by its' appearance, this Balrog is harmless. 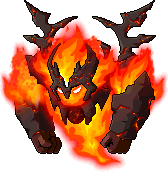 It might seem strange that the maplers' worst enemies can become pets, but the Balrog is a very loyal one to own. It has many amusing habits and sometimes dons a suit of armor so that it resembles a full grown Crimson Balrog. The wings are just for show; unfortunately it can't fly. This is a lucky Golden Pig that came out for the Lunar New Year. It devours chocolate coins when it can. This is one of the Hungriest pets in the game, so keep your eye on its closeness bar. Unlike some of the other pets, this one can actually use its wings, and float above the ground instead of touching it. The Elephant is a smart and loyal pet. It also features one of the most voracious appetites in the game, making it difficult to feed. Elephants have yet to be released in some versions. They can sometimes be seen wearing Arabic armor. The Cloud Leopard is a smart pet. It is very obedient. It's rare, and only available in a few versions. The name Cloud Leopard comes from the cloud-shaped patches on its body. Sun Wu Kong is a new pet. It is based on a monkey character from a Chinese Folk Tale. This is the egg of a baby Dragon. It might hatch soon. This is a baby Dragon which hatched from the egg above. Though young, it can already breathe fire, and if it's very happy it can even make flaming hearts. If it's unhappy, do something quick or you just might drown in its torrent of tears! It sleeps in small trees and already has the ability to fly, though only just above the ground. Through the use of a special item, it can evolve into one of the other dragons. A dark dragon with an evil look to it. Its fiery breath is fierce, and when angered it fires beams of pure evil energy from its mouth. The most amazing ability this pet has is that it can actually transform into a two headed huge form. When it sleeps, the baby dragon can sometimes be seen resting on its head. This dragon may be related to the Dark Wyverns of Leafre. A red dragon, always alert. When it gets angry, its eyes glow orange and it breathes red hot fire. If it gets upset, it cries a lot, contradicting its usual ferocious appearance. It leaves huge amounts of tears gathered around it. If it becomes confused, large question marks will float about. Like the dark dragon, it too possesses the ability to transform into a giant red serpent. It dreams about the baby dragon when it sleeps. May be related to the Red Wyverns in Leafre. A green Dragon with long curved horns. This one can't breathe fire. Like the other dragons, it also possesses the ability to transform into a giant serpentine form. It cries huge amounts when it gets upset. The baby dragon can often be seen in its dreams when sleeping, though it doesn't usually look happy. It craves raw meat when hungry. Unlike the others, this one doesn't correspond to a wyvern of Leafre. A Blue dragon with a cool personality. 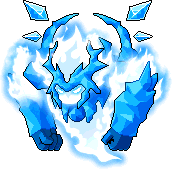 This one breathes icy cold breath when it is angered. If it gets upset, it cries a lot, contradicting its usually calm appearance. It leaves huge amounts of tears gathered around it. If it becomes confused, large question marks will float about. Like the other dragons, it too possesses the ability to transform into a giant blue serpent. It dreams about the baby dragon when it sleeps. May be related to the Blue Wyverns in Leafre. This is a new pet, recently introduced in TaiwanMS. It is based off of a costume that can be worn by its master. It is one of the few pets that wears clothes. Also, it is capable of leveling up, and when it does so, it transforms into a rowdy Ribbon Pig and runs around, another ability that can be used by its master. This is the black variant. Unlike the Pink and White Rabbits, this one was created in GlobalMS and will be released soon. They are well behaved and quiet most of the time, but can be quite stubborn. They aren't particularly hungry, so feeding them shouldn't be a problem. Rabbits often wear Red Scarves around their necks. Currently, it can only be obtained by purchasing an iTCG card Booster pack and Redeeming the code from it in the cash shop. Codes that give black bunnies say "C01". A Blue furred Husky. Husky are smart, loyal, and hungry pets. They do well in cold environments. They don't have a great appetite, though it might come as a surprise. Active pets, and some wear Fur Coats and Yellow Tights, or even Pig, bunny, and Skeleton suits. May be related to Ice Wolves or Hectors. Currently, it can only be obtained by purchasing an iTCG card Booster pack and Redeeming the code from it in the cash shop. Codes that give Blue Huskies say "C02". This pet is very unique because it is EXACTLY the same as a monster, instead of just being a miniature version. It has the ability to transform into a giant Furious White Monkey, too. When it gets hungry, it eats a watermelon. A Halloween themed pet released in GlobalMS. It has a spooky look. The Jr. Reaper is unique in that all its commands are available from level 1, but only give 1 closeness, which makes it extremely difficult to level. It can also sprout dark wings from its side whenever it starts to dance. The Jr. Reaper's weapon of choice is the Guitar, though it can't attack with it, unlike its' master. Sometimes, they'll also be seen carrying picket signs with varying funny messages on them. A porcupine pet, created in GlobalMS. Currently, it can only be obtained by purchasing an iTCG card Booster pack and Redeeming the code from it in the cash shop. Codes that give porcupines say "C03". It heavily resembles the Porky monsters found in Mu Lung. In other version the porcupine is cash shop item. A cute snowman which was brought to life. If you don't feed it often enough, he'll begin to melt. Sometimes, he'll start rolling and become an enormous snowball! This is a new pet for Christmas 2007, and it's available in the cash shop permanently. A baby orange mushroom. When it transforms, it turns into a Zombie Mushroom, and when it gets angry, it becomes a Horned Mushroom. Seems to be based off of the tiny Orange Mushroom which follows around the lead character in the MapleStory anime. By far one of the smallest pets. A cute skunk pet from GlobalMS. Has the ability to disappear for a short period of time. Skunks are refined pets with a taste for quality, but they often fall back into bad habits. Like Jr. Reapers and Turkeys, they tend to make somewhat insulting, but loyal, companions. Currently, it can only be obtained by purchasing an iTCG card Booster pack and Redeeming the code from it in the cash shop. Codes that give Skunks say "C04". Don't make it angry, though, or you'll regret it! An orange tiger. Tigers aren't hungry pets, and are fairly content most of the time. They're obedient and skilled in a number of ways. Tigers can sometimes be seen running around in Ninja outfits or Magician's robes. Created in GlobalMS. Currently, it can only be obtained by purchasing an iTCG card Booster pack and Redeeming the code from it in the cash shop. Codes that give Orange Tigers say "C05". A tiny metallic egg-type device. How can you tell when it's going to hatch? This is the baby form, evolved from the robot egg. It's the second ever evolving pet. It has tiny little laser guns in its hands, which mysteriously eject shells. Feeding it pet food charges the batteries, easily indicated by the symbol over its head. It can hover a little, but not for long. Like most robots, it has to hook up to a charging station when it sleeps. 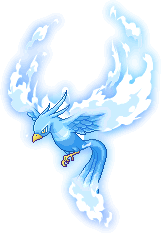 The blue version of the baby's evolved state. It's much bigger, and fiercer. It looks like a pure robot, but there's really a tiny yellow creature piloting it. Actually a transformer, it can change from cat form to a more humanoid appearance. This form wields a lance and shield, but don't expect it to help you in battle or you'll be sorely disappointed. Tied with the other evolved forms for "Largest pet in the game". With bigger robots comes bigger charging stations, and this one's looks like a huge space dock. The Green version of the baby's evolved state. It's much bigger, and fiercer. It looks like a pure robot, but there's really a tiny yellow creature piloting it. Actually a transformer, it can change from cat form to a more humanoid appearance. This one wields a polearm or spear, but don't expect it to help you in battle or you'll be sorely disappointed. Tied with the other evolved forms for "Largest pet in the game". With bigger robots comes bigger charging stations, and this one's looks like a huge space dock. The Red version of the baby's evolved state. It's much bigger, and fiercer. It looks like a pure robot, but there's really a tiny yellow creature piloting it. Actually a transformer, it can change from cat form to a more humanoid appearance. This one wields a two blades, but don't expect it to help you in battle or you'll be sorely disappointed. Tied with the other evolved forms for "Largest pet in the game". With bigger robots comes bigger charging stations, and this one's looks like a huge space dock. The Yellow version of the baby's evolved state. It's much bigger, and fiercer. It looks like a pure robot, but there's really a tiny yellow creature piloting it. Actually a transformer, it can change from cat form to a more humanoid appearance. This one wields an energy blade, but don't expect it to help you in battle or you'll be sorely disappointed. Unlike the other forms, it has huge, pink biological-type wings which it can use to glide short distances. Tied with the other evolved forms for "Largest pet in the game". With bigger robots comes bigger charging stations, and this one's looks like a cannon. The only evolved form that is NOT a cat-like mecha. This Gorilla can be pretty dangerous when angered, pulling out two huge arm cannons that drop large shells when fired. It has speakers in its back for music on the go. In its flying/swimming form, it grows a shark fin mysteriously. In order to feed it, a little helicopter will fly in and dock with it! With bigger robots comes bigger charging stations, and this one's looks like a launcher. This is a very special snail pet. By doing a quest for Mar the Fairy of Ellinia, you can obtain this pet. It only lives for 5 hours, but the 5 hours don't start counting until you take it out of your inventory. It cannot be revived and doesn't use many commands. It looks like a baby Moss Snail or Mano... The Crystal Rudolph is the Christmas pet released in 2008, straight from Happyville. It may look similar to the regular Rudolph, but it sports a number of different commands, including a transformation which turns it into a glorious adult Reindeer. Only available during the winter Holidays! A trustworthy pet who is equally quick-witted. Unlike its masculine appearance, it is prone to insecurity and shyness. Originally from BrazilMS. A pet that won the "create a pet" event in GlobalMS. It has several of the usual commands to cry, get angry, dance, and so on, but it's special ability is to transform into a white Swan boat. A short and chubby pet summoned through the Goddess’ mirror. It is temperamental. Modeled after the currently strongest boss, Pink Bean. Pink Bean will not expire like other Pets. Obtainable only from the Cash Shop Surprise in GlobalMS. Baby Tiger, the big star of 2010. A strange alien that crash landed in the Maple World. It can't speak, but it is affectionate and deeply curious. Mir, a cute baby dragon that has just hatched from a dragon's egg. Ruby, a cute baby dragon that has just hatched from a dragon's egg. A research monkey that helps Dr. Bing with his experiments...by posing as the test subject! This little monkey wears a suit as protection from the atmosphere. Cloy can inform you of pet commands or transfer closeness between pets. Like all cash shop items, Pets only last for 90 days. At the end of this time, they become lifeless dolls once again. They can be revived by buying a Water of Life from the cash shop and completing a quest. Pets follow behind the player, trying to keep up. If the player has a relatively high amount of speed, the pets will sometimes have trouble keeping up. This can be remedied by completing special Pet Quests that allow them to match speeds. Pets, like their owners, learn different things at different levels. As it progresses it learns more commands that give greater amounts of closeness. The highest level a pet can reach is level 30, needing a whopping 30,000 closeness. They can be out, following the player, or put up and inside the inventory, so as not to get lonely when the player is away from their computer. When a pet is neglected, its hunger slowly goes down, until it reaches 0, at which point it loses massive amounts of closeness and returns to the inventory on its own. Other than that, pet raising is fairly simple, and provides an additional level of depth to the game. Closeness can be transferred between pets. By purchasing a special reset scroll from Cloy, the pet master in Henesys park, a pet owner can take the closeness from an old pet that has returned to its doll form, and give it to a newly purchased pet. If the new pet already has some closeness, then it will gain only as much as is needed to catch up to the old pet's level. For example, if a new pet is purchased from the cash shop, and has already reached level 5 before trying to transfer closeness, then it will only gain the closeness needed to get it to level 17, which is the level of the old pet, instead of adding the two together and causing the pet to exceed both levels. Like their owners, pets can wear equipment purchased from the cash shop. Unlike player equipment from the cash shop, however, pet equipment can be scrolled for Speed or Jump. There are pet equipments that are common to all pets, like Bucket Hats, and others that only certain pets can wear, like the Pepe platform for Yeti and Crimson Armor for Balrogs. These common ones only have 5 slots, while the specific pet equipments are 7 slots. Pet scrolls are fairly cheap, because not as many people use pet equipment. Often players who receive these will drop them since they're not worth the trouble. In addition to clothing, pets can also be equipped with the Meso Magnet, which allows the pet to pick up mesos from Monster drops, and Item Pouch, which allows it to pick up the monster's item drops. New to several versions, particularly GlobalMS and MapleSEA, there are also Auto HP and Auto MP pouches. These will automatically use a potion for either HP or MP whenever the player's points reach a certain level, determined in the "game options". These take the place of the pet skills listed below. Adds the item & meso pick-up skill to a pet perminantly. It can not be transferred to another pet. Most pets in GlobalMS come with this skill. There is a checkmark to turn it on or off. For example, you can turn it on to loot while training solo, or off so you don’t steal while in a boss party. This skill replaces both Item Pouch & Meso Magnet equipment. A skill that enables pets to pick up items and mesos within the area without the character having to move. Available to pets with Item Pick-up Skill (Item Pouch or Meso Magnet equipment). This skill replaces Wing Boots equipment. Use this skill to expand the pet's moving range by 3 times. Available to pets that have Automatic Pick-up Skill. (Can not be used without Automatic Pick-up). This skill replaces Binocular equipment. Adds the skill that enables pets to pick up mesos and items that have been dropped for more than 30 seconds, thus rendering it as leftovers. Available to pets that have Meso pick-up or item pick-up skills. This skill replaces Magic Scales equipment. A skill to restrict pets from collecting selected items. Available to pets that have Meso pick-up or item pick-up skills. This skill replaces Item Ignore equipment. This skill automatically recharges one’s HP using potions you select, provided you set up an alert in the system options. This skill replaces HP Potion equipment. This skill automatically recharges one’s MP using potions you select, provided you set up an alert in the system options. This skill replaces MP Potion equipment. Choose the Buff Skill you want from the Skill Window and drag it to the bottom of the Pet Equip tab. Once it's saved, the pet will use this skill automatically. Can not be used on some skills. This skill replaces Auto Buff Gem equipment. Allows your pet better movement across multi-level maps when using Meso Magnet or Item Pouch. Your pet will also learn Auto Feed, allowing it to automatically eat any regular Pet Food you buy from the Pet Food Merchant. This skill replaces Smart Pet Pouch equipment. This skill is not yet avalible in GlobalMS. This skill replaces Auto All Cure Potion Pouch equipment. Doofus sells pet food in Henesys. As Pets spend time following their masters, their Hunger value slowly goes down. When it reaches 0, the pet returns to the player's inventory at a massive loss of closeness. Once it reaches 50, the pet will begin to mope and show signs of weakness. While starvation is one of the problems with owning a pet, overfeeding it is another. It gains 1 point of closeness when fed, so sometimes new pet owners will continually feed their pet. This will actually cause the closeness to decrease as well. Pet food can be purchased for 30 mesos from special pet food sellers, which can be found in Mu Lung, Ludibrium, Orbis, Leafre, and Henesys. In several versions of MapleStory, it is possible to have up to three pets follow you. In order to gain this ability, one must purchase a special Pet Treat from the cash shop. Take this treat to Trainer Bartos, found at Henesys Pet Park, and he will ask you to find a hidden note. Complete the Jump Quest here and double click on the basket of kittens at the top to gain the note, then return to Bartos. Once this is completed, the player will gain the skill, Follow the Leader(s), which enables him or her to have more than one pet out at a time. ↑ 1.0 1.1 Does not apply for the effect in MapleSEA. ↑ Does not apply for the effect in ThailandMS. ↑ 3.0 3.1 Applies for the effect only in ThailandMS. Starting with the 2nd job advancement, a number of Summons become available to certain jobs. Some of these have elemental Attributes, while others have different effects. Evil Eye, a.k.a. Beholder is the Spearman's only summon. It was once an evil spirit, but to absolve its sins, it gave up all its memories. It is obtained automatically once a Swordman advances to Spearman in 2nd job. It heals the warrior every few seconds, in 2nd job. In 3rd job, another skill allows it to cast a buff that adds Weapon Attack, Weapon and Magic Defense, Accuracy, Avoidability, and Critical Rate. It also gains the ability to scream, stunning and damaging enemies in range. It can also attack freely by toggling a skill on, but it won't be able to heal or buff you when attacking. In 4th job, it can also launch a counterattack on an enemy that attacks the player. You can also sacrifice your Evil Eye to gain more boss damage and ignore more enemy defense, as well as ignoring the cooldown of Gungnir's Descent, your main 1v1 skill. ?? ?? ?? In Third Job, Rangers receive the firy Phoenix. Phoenix has a fire based attack where it fires a flaming tornado that can hit up to 4 monsters nearby at a time. In Third Job, Snipers receive the chilly Frostprey. 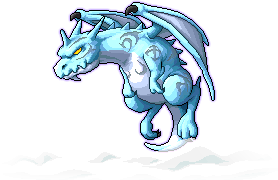 Frostprey has an ice based attack where it fires an icy tornado that can hit up to 4 monsters nearby at a time. In Third Job, F/P Mages pick up the Viral Slime, which can attach itself to an enemy nearby. When the enemy dies, the Viral Slime splits into two, attacking 2 other enemies, up to a max of 10 at a time. In Third Job, I/L Mages pick up the Thunderstorm, which follows the player slowly and deals 310% on up to 5 enemies, and deals 30% more damage for every 1 less enemy it attacks, for a max of 430%. ?? This is one of Outlaw's summons. Unlike most other class summons, this one will not follow you, staying in the same spot where it is summoned and attacking monsters that come in a certain range. 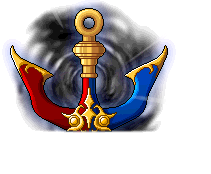 It fires from the cannon at a very fast speed, but cannot attack when the player is on a rope. Resembles the biological form of a Blocktopus. This is one of the Theif's skills. It creates a square area that attacks any monster that enters it. While the Dark Flare is active, damage dealt to you by monsters is reflected back at the monsters. In Fourth Job, Bishops gain the new Bahamut Dragon, which is Holy elemental. 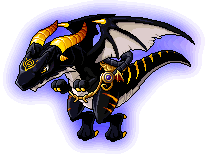 Bahamut can cast holy magic from its mouth, hitting up to three nearby monsters within range. Like most other summons, it follows the summoner attacking the nearest group. In Fourth Job, Fire/Poison Arch Mages gain a fire based summon, Ifrit. 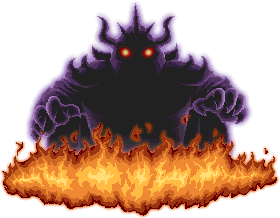 It attacks by pounding its fist into the ground, hitting up to three monsters. Like most other summons, it follows the summoner attacking the nearest group. When points are added into the Ifrit skill, a F/P Arch Mage also gains additional magic mastery. In Fourth Job, Ice/Lightning Arch Mages gain an ice based summon, Elquines. It attacks by pounding its fist into the ground, hitting up to three monsters. Like most other summons, it follows the summoner attacking the nearest group. When points are added into the Elquines skill, an I/L Arch Mage also gains additional magic mastery. These cute little creatures aid the Blaze Wizard in 4th job. You can choose one of these to summon when using the skill. While summoned, Ignition's effects are improved to allow the Blaze Wizard to ignore enemy defenses and elemental resistances, with a reduced effect for party members. As soon as a Citizen decides to join the ranks of the Resistance as a Wild Hunter, they have the ability to ride a jaguar. It's to the Wild Hunter's best advantage to ride their jaguar at all times. Several colors of jaguar are available for capture and riding (plain black, brown, red, violet, blue, a special black, and a special white. If a Citizen chooses to become a Mechanic, they learn the ability to ride their own robot. All skills used by Mechanics are to be done through their metal friend. With a color-changing chip, you can change the tint of your Prototype, and even some of the skills' tint color too. This tiny little robot floats near the Mechanic, attacking nearby monsters which are attacked by the Mechanic. Up to 3 of them appear at max level. In 4th job, when Satellite Safety is active, the Satellites will disappear when you take a large amount of damage, causing you to re-activate them. This robot stays in one place, increasing the speed of all non-boss monsters in the map by 30 as well as decreasing the defense of said enemies by 15%. This robot stays in one place, healing any party members that press down within its range. ?? In some versions of MapleStory, there are monsters, called mounts, that can be captured and ridden through use of the skill Monster Rider. There are currently four mounts: one that can be acquired at level 70 upon completion of the 3rd job advancement, another that can be acquired at level 120 upon completion of the 4th job advancement, and the last is received at level 200. The fourth is a special, time limited mount only available in JapanMS. Mounts have a number of special abilities, such as bypassing the cap on maximum speed and adding the non-slide effects of snowshoes, regardless of what shoes are currently being worn. Mounts cannot be used inside of Party Quests, even in situations where the benefits of speed do work. They also cannot be ridden while on some ships between areas. This unique monster is gained through a quest. You must protect it from monsters, while collecting 5 pheromones the hog itself will drop over time. Break boxes to get the other 5 items, which are called Kenta's Reports. The quest is only available to players over level 70, already on the third job advancement. You will get the skill and the saddle. After this, you will need 20 million mesos. Pay Chief Tatamo of Leafre this money and gain a potion. Go to a special map near Korean Folk Town. The hog itself spawns like any other boss monster. Use the purple potion on it. Once the quest is complete, the Watch Hog can be ridden by the player. It gives an instant 150% speed and 120% jump, faster than maxed haste. This makes movement through towns and such much easier. This hog may also level up, but there is no actual purpose other than getting a Silver Mane. This is the higher level monster for riding. It looks quite fierce and surpasses a number of limits. The Boar gives a boost of 170% speed, which is extremely fast. In order to get this boar, you must have 50 million mesos as well as the previous hog at level 30 and completion of the Fourth Job Advancement. Talk to Kenta, he requests you to get certain ETC items (namely 600 Rexton Skins, 400 Skull Shoulder Pads and 400 Wooden Shoulder Pads). After this, pay him 50 million mesos and you will receive the Silver Mane. This is the final monster for riding. It is a Strong red dragon that surpasses a number of limits. The Red Draco is the best mount currently available. It has a speed boost of 180% and 120% jump. To get this mount is very simple: when you hit level 200 just unequip your level 120 mount and saddle and talk to your 4th job instructor until he gives you a quest which will give you your Red Draco. Also, this dragon has the ability to evade monsters attacks while being ridden, increasing portability. A UFO Mount, available only from a KMS and GMS event quest.at the moment, Not instantly obtained(like all other mounts). Obtainable from the KMS and GMS "Saving Agent Gaga" event. Has a dash-like skill with a whopping 190% speed, the same as the Red Draco. Can be powered up every 10 times you complete the "Saving Agent Gaga" event, the mount also gets a better speed boost when you complete the event 20 times. Comes with a skill that alters the krypto rocks and makes a tiny tractor beam that flashes rainbow colors and makes the death sound for robos. This is another special event mount, only available in an event in MapleSEA. It comes together with the Monster Rider skill, thus it's usable even at level 30. It looks vaguely similar to the rocking horse ridden by Toy Trojans, or Nightmares, however its' wide eyes give it an innocent look, instead of the evil glares of a monster. It takes a new, unique saddle to ride it, which sports a yellow star on the side. It's time limited as well, just like Magic Square, so they will all eventually expire. Like the Watch Hog, it gives 150% speed, 120% Jump, and also has the 100% swimming speed that the Magic Square has. This is a special mount, only available in JMS. A bit hard to see, but it is a glowing pink-white pad. It was derived from Nina's Magic Square, an item which Nina, a character from the MapleStory anime, uses to get around. The saddle for this mount is a tiny ribbon pig, designed to look like Nina's pet. This comes exclusively from a quest that was available for a short period of time. It is also time limited, and all Magic Squares will expire in approximately one year. This mount adds 150% speed, 120% jump, and a new stat called "Swimming speed" at 100%. It is unknown what swimming speed does at this point, but it might be used for Aqua Road navigation. One of the young birds raised on Ereve. At level 50, a Knight of Cygnus can go to Neinheart to start the Mount quest. Unlike the standard classes' mount, you don't capture it in the wild; instead, it's raised from an egg that the player is given. Once the egg reaches its mature form, the hatchling must be returned to Ereve while the player gets a special potion from Kenta for 10 million mesos, which makes this mount substantially cheaper than the Standard class hog. It grants 150% speed and 120% jump, just like the hog. At level 100, during their 3rd job, Cygnus characters are given a chance to upgrade their mount to the equivalent of a Silver Mane. This is likely tied to the "mini-advancement" which Cygnus Knights go through at level 100, gaining extra skills and mount upgrades. To get it, you must pay a total of 27 million mesos and collect 90 of several Leafre monsters' etc items to make special food that causes the Mimiana to grow. Mimio adds 170% speed and 120% jump, like Silver Mane. A newly hatched holy beast, born from the guardian of Ereve Shinsoo. It is a reward to Cygnus Knights who reach their maximum level, 120, similar to the Red Draco for standard classes. Since the Knights max out at level 120, this is the last mount they can obtain. It costs 50 million mesos to obtain. Gives the same boosts as Red Draco, 180% speed and 120% jump. The level 50 Aran mount. To get this, the player must first accept the quest from Pucci, then go to Aqua Road and give Nanuke 50 Sea Horse tails and 1 Wolf Cub Vitamin. The Wolf Cub Vitamin is obtainable from Kenta in the Zoo. It costs 10,000,000 mesos. The players must then go back to Rein and talk to Pucci, who will give you the Werewolf tamed monster. You will then get a Wolf Mount quest from Scadur in El Nath, which the player will need 50 Jr. Yeti Skins to complete. He gives you the Saddle with this. 150% Speed, 120% Jump. The level 100 Aran mount. In order to acquire this mount, you must have acquired the level 50 Aran mount,complete the jump quest, and you must pay 40 million mesos.170% Speed, 120% Jump. The level 150 Aran mount. In order to acquire this mount, you must have acquired both the level 50 and 100 Aran mounts. This upgrade is free as of the Chaos patch. 180% Speed, 120% Jump. The level 200 Aran mount. In order to acquire this mount, you must have acquired all of the previous Aran mounts. 200% Speed, 120% Jump. This is the fastest mount in the game. This is the first stage in which you can ride Mir. You must have 10 million mesos to buy him. Speed is 150% and Jump 120%. Second Stage of Mir. You must have 30 million mesos and must have acquired the first mount. Speed 170% and Jump 120%. Last Stage of Mir. You must have acquired the first and second stages in order to get this mount. You must also have 60 million mesos to buy it. Speed 180% and Jump 120%. In some versions, covers which will alter your mount's appearance are available in the Cash Shop. They do not alter the stats of the base mount in any way, retaining their experience, level, speed, and tiredness rates. An unusually large mount. It looks pretty fast, even though it isn't necessarily. Its' saddle looks quite regal, and when it gets tired it will slump down so that its body is resting on the floor. The frog is unique in that it hops along as opposed to the steady gait possessed by the other mounts. The saddle is a large basket-like seat, which seems to provide some sort of shock absorption as the rider doesn't bounce around much at all. Contradicting the stereotype that turtles are slow, this one makes a surprisingly good mount. When ducking, the turtle recedes into its shell. A young Yeti, which is slightly smaller than the monster version but much larger than the pet. By riding it in the same manner as a Pepe would, players can have a Yeti of their own to lead them around. A red Ram. It's not very large, but it'll get you where you need to go. An Orange Mushroom. Can be acquired from Anniversary Item Pot. Mounts share much in common with pets. The main difference is that, instead of Hunger, mounts have a value called "Tiredness." A mount's tiredness starts at 0, and slowly rises as it is kept out. The more powerful the mount, the slower its tiredness value rises. The maximum value of Tiredness increases as a mount's level increases. At level 30, a pig will go up to 200 tiredness before forcibly dismounting you. Mounts gain experience when they are fed, in relation to how much tiredness is relieved. Thus, to gain optimal experience, it is best to wait until a mount's tiredness is between 20 and 30. The maximum Experience varies from 4,520 to 4,608, which is level 30. Mounts, unlike pets, are fed an item called Revitalizer, which is significantly more expensive at 1,000 mesos per bottle. Revitalizer can be purchased from the pet food sellers, which can be found in Henesys, Orbis, Ludibrium, Leafre, Mu Lung, and Ariant. You can also choose to not give your mount Revitalizers at all. A level 1 mount can reach 99 tiredness before it kicks you off of it at 100 tiredness. Then the tiredness level returns to 95. You can just get right back on it again and keep riding. From 95 to 100 tiredness is about 5 or so minutes of riding. So if you do not care about leveling your mount and wish to not buy Revitalizers, you can just do this. The mount cannot die either, so you can just keep having his tiredness level hit 100 over and over again, and it will always return to 95 tiredness again. This page was last edited on 4 May 2015, at 06:22. This page has been accessed 725,115 times.